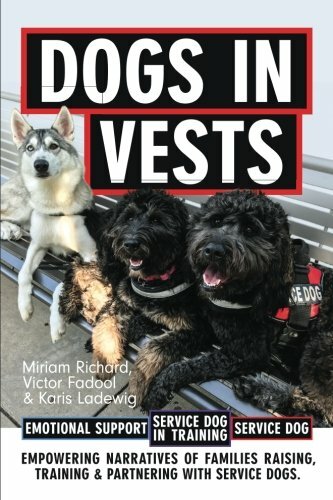 Dogs in Vests is an inspiring narrative that will engage you through personal heartfelt experiences with service dogs. The authors open up with a vulnerability that pulls you in and leaves you with more knowledge and empathy for the role these dogs play in all the lives they touch. Mazie, a Labradoodle puppy and fluff ball of fun, becomes a medical alert dog with life saving skills.You’ll learn of Stella, a Labradoodle with record breaking allergen detection skills, who is setting a new standard for a service dogs ability to help her handler navigate digestive disease. Malachi, a Husky hybrid mix, is full of life and the perfect match for on-the-go medication free emotional support. Full of eyeopening possibilities, Dogs in Vests affirms that you too can train your own service dog with some effort, tenacity, and the guidance of expert trainers. You will appreciate and love your own pup even more. So what’s difference between Emotional Support dogs and a Service Dog? Or a household pet? Emotional support dogs are a wonderful source of companionship and provide a routine to help discipline and regimen. They are not required to be well trained and don’t do specific task to mitigate a disability. Emotional support dogs have great value and after a doctors prescription have gotten people off multiple medications. Dogs got them more engaged in life, outside, working out, being exposed to things they wouldn’t have self initiated. Service dogs are trained in specific tasks to help someone over come a disability. They are highly trained and should pass Canine Good Citizen and Public Access Tests. What are Service Dog certifications? Currently there is not a specific certification. There are several you would want to meet because we are trending that direction. There is the IAADP international service dog. These require training logs. There may become a national standard as the different specialties of service dogs develop. Miriam Richard. Author of “Dogs In Vests” is a certified Health Coach and a self-described out-of-the-box thinker. Having received her bachelor’s of science degree in kinesiology with a minor in psychology from the University of Texas (Austin) and a master’s of science degree in physical therapy from Texas Women’s University (Houston). Miriam’s book is collection of empowering narratives of families raising, training & partnering with Service Dogs. What got you into service dog training? As I was completing my certification for Health Training I realized that whatever I would do for a career would always have to fit into what I was really having to do with my responsibilities as a mother/family member. When we got a puppy and my children got sick at the same time and I was still going to have to put the same amount of time into that dog: I realized I could even shape it further above and beyond the normal well behaved pet. This dog could actually perform some of the medical alerts that would help me keep my kids healthy. Training the service dog was a happy way to try to tackle and deal with severe and intense medical issues. Dog training was a way to bring the family together on a positive note, embracing a puppy, and uniting us. We made it a family project. We included the children to help with their perspectives into the book also for them to own it to on the responsibility of training their dog and being able to reproduce it at a later date if they would need to when they move out from under my house. Having always had a love of dogs and an interest in training, I became focused when my son had been diagnosed with a G.I. illness and her daughter was found to be anaphylactic to raw egg whites she naturally was drawn to see if a dog could help to solve the problem. I have always had a love of dogs since I was 8 year old. I had been training my toy poodle to be a circus dog. I wanted to be that trainer. And then when I was in college we had a really smart Labrador retriever that we were able to teach two step commands like (take this) the ski rope and (give it) to dad she would even swim it out to the jet ski. I was thrilled beyond belief to know that dogs were capable of so much more. In the 1990’s our family’s concrete recycling plant became a training ground, for search and rescue dogs because the rubble was perfect to many of the earthquake/bomb and disaster type rubbles. So I got to watch and observe how they train them in the 90’s. Stella is one of the star’s of your book, tell us about Stella, your service dog. Stella is a 2 year old Labradoodle. She was bred by the Novacek family here in DFW. Stella is agile and smart. I found out through Dognition dog test at Duke University her learning style and what she is capable of learning. She’s so bright we just keep adding more tasks. Mazie is a medical alert dog for body chemistry changes. She voluntarily alerts to low cortisol and was trained to alert to low blood sugar for the Ladewig family’s daughters. It was a joy training her. I trained Stella and invested so much in her, that we had Stella help teach Mazie by modeling the desired behavior and cut learning time in half. Are allergen detecting Service Dogs a new development? The allergen detection dogs have been around for a little over decade. We are asking Stella to detect over 11 different starch and grain products to help alert to my son’s most intense triggers for flares. This large variety scents for this type of work is new. Actually, I was dissuaded by many people to not do it. I had to go outside and get multiple resources to see how to implement my plan. I don’t think anyone else would have taken it on. But as I said earlier I had the seen the training of the newly developed field of search and rescue dogs in the early 90’s so I didn’t give up easily. In your book, there are also co-writers. Who helped write this book? Yes, while waiting on dog to be trained we felt it would be a positive experience for all interested family members (both from the foster family and the receiving family) to contribute their perspectives. One of the Ladewig daughter’s even wrote fro the dogs perspective adding in. A fun element that widens the age rage for the books appeal. Most books are technical on how to train and care for your dog, but ours adds in stories, engaging, all aspects of breeding, training, fostering, and receiving the dog. We have also included and emotional support dog owner’s perspective since their has been so much news publicity for working dogs. Is this a how-to manual on training your Service Dog? It is specific in the areas where we chartered new territory on training multiple allergen detection. Our book empowers, and motivates the reader to get involved on some aspect of training their own dog be it for a pet, emotional support or a service dog. Did you involve professional trainers and other resources? We involved at least 3 professional trainers. We consulted with search and rescue dogs. Youtube videos. 4 different books, Debbie Kays book, and more. We have included all the resources in the back of our book to help guide the reader. However we still strongly suggest involvement from a certified trainer to help you with your roadmap and in case you come up on any stumbling blocks that you aren’t able to find other resources to help you with. You are also working on a film? We are making a “dogumentary.” This will show how we tackled category of scent for multiple starches for Stella since many said not possible. The film show lots of socialization and how we capture dog behavior at the zoo, the Fair, and different social aspects where should be able to handle themselves well. Training a Service Dog, is this something the reader wants to take on by themselves? If you are an innovator or if you are someone who follows through to get things finished at least 80% of the time then it is very likely you could be interested owner training. If you have extreme medical issues you will want to include consulting with an expert in that field, unless of course one doesn’t exist yet. If you’re more of the laid back and want finished product, the price difference could be 15-20k. So if you are wanting a dog to alert to migraine headaches which are not life threatening but debilitating, you may be able to learn enough to do it yourself. Service animals are in the news, what are your thoughts? We’re thrilled were excited to see this category take off in the medical field and have extra resources to help people who have allergies and food intolerances besides just dealing with medication. Diet is becoming seen as a real way of healing people so were really excited to embrace this concept. Has the experience of training Stella and Mazie been a positive for you and your family? Our family has enjoyed it so much that we are taking on our 3rd dog. Hoping to take on dogs each year and placing them with proper families in need. It has brought everyone together including our greater community of local high school student volunteers. We’ve gained more empathy toward not only people with disabilities in general but animals as well. It takes the whole family being involved. Y. New puppies are as needy as babies and they really cant be left in a crate for more than 2 hours. Can you tell us where we can find your book? Our book is found on Amazon, iBooks, Barnes and Noble online, and special order from boutique book stores. All proceeds form book sales benefit the Mazie fund which helps to pay for Mazie care to make her affordable for the family by covering food, vet bills, and any further training she may need taken care of for life. We participate in many events, book signing events, special appearances, demonstrations, theres all kinds of fun things we participate in.